The ottoman is perfect when it comes to accent furniture. I love them. Incredibly versatile and practical; ottomans are great as coffee tables, footstools, extra seating and even storage. 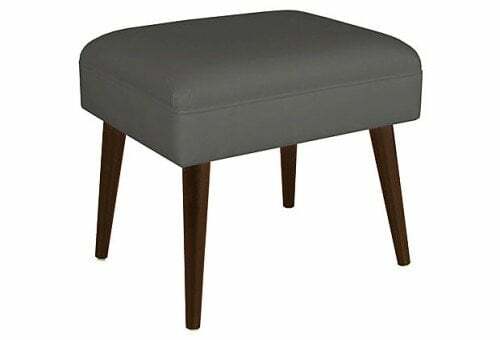 There are so many ottomans for sale but this post is about how to make an ottoman or small footstool. Making an ottoman is relatively straight forward, once you work out the style you like. 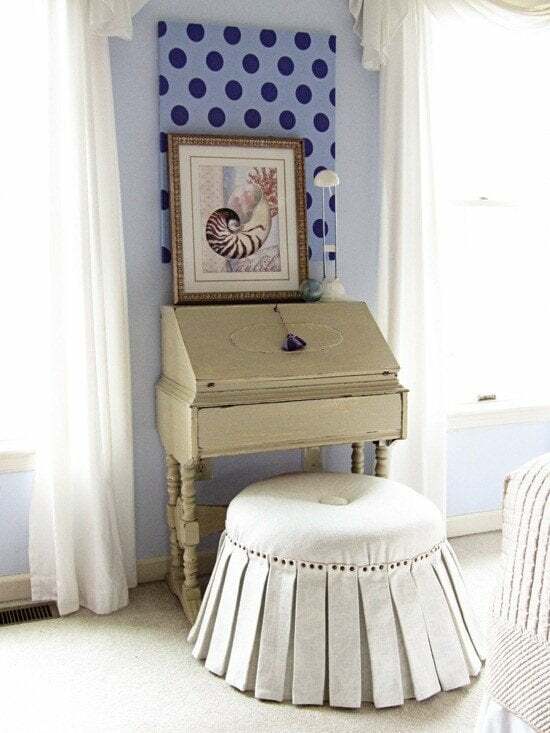 Here are lots of ideas, from 'no sew' ottomans to more advanced ideas for making your ottoman. In most cases, all you need is a staple, a hand saw and a glue gun. 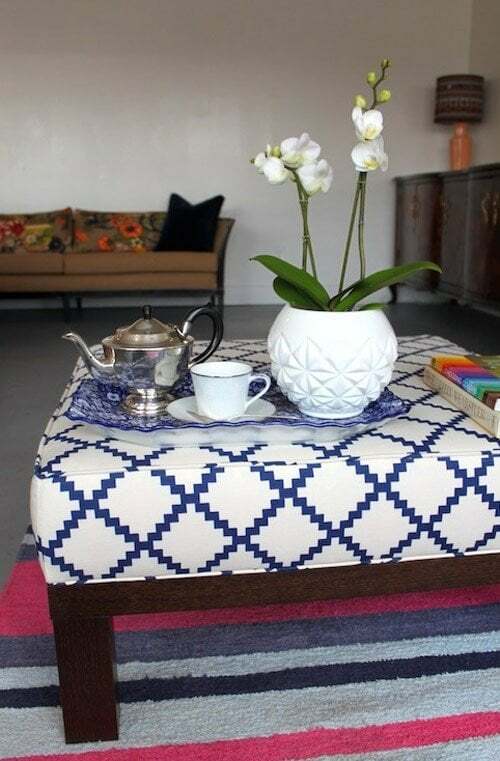 Keep reading to find different ways you can make, build and upholster an ottoman, from the simple DIY to advanced, fancy ottomans, to discover which style is right for you.There are videos with upholstery tips - starting with how to make a round ottoman. For an easy round ottoman with legs; this video shows you how to make a mid century style ottoman for less than $52. It uses less fabric and wadding but the result is great. There is also a great tip about how to slant your legs for that real mid century look - and get it right. 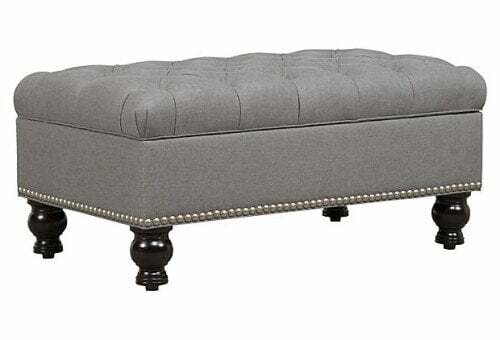 What about doing a DIY knock off of this ottoman from One Kings Lane? It has short squat legs and a larger body, for storage. The top has button tufting and white piping. Go through the videos below that show you how you can manage both easily. Want to DIY it? Cover a round large storage container, with wadding or foam. Make sure its strong enough to sit on. Cover the top separately, adding button tufting and hot glue on some piping. And finally add your legs. You have created a ottoman with storage that you can use as a coffee table, foot stool or side table. If you need help with tufting, use the tips on tufting, piping and more in the video below. 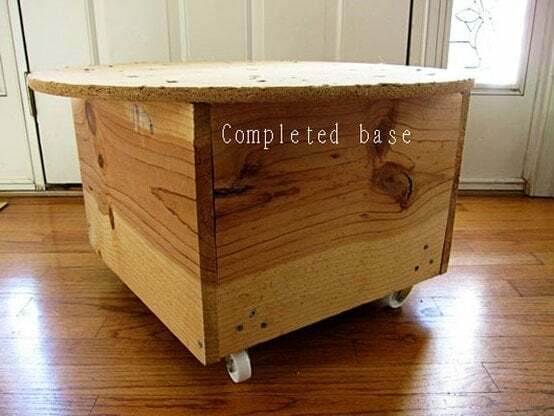 You can adapt this concept to make a storage ottoman bench. Ottomans with storage are very popular and if you like a long rectangular shape, use a bench. Look for a bench, blanket box or chest that is strong; that you can makeover to create a large storage ottoman like the one above. You can even use am outdoor or garden storage bench and you have a perfect 'end of bed' bench. Line the inside with fabric and add final feet or coasters for a better finish. 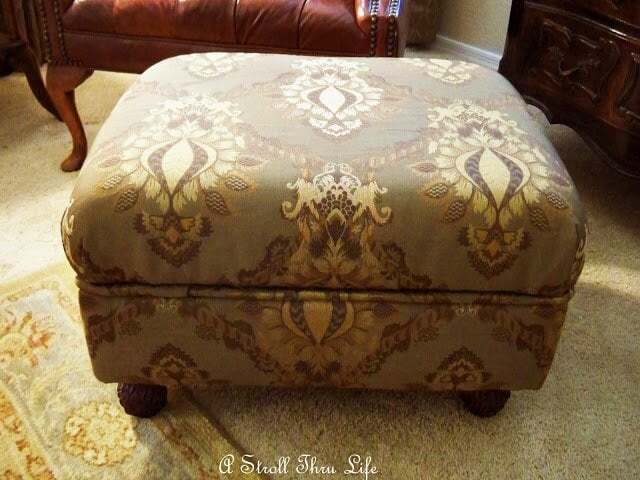 InMyOwnStyle has a two part tutorial on How to Make a No Sew Round Ottoman from scratch. Here is the base; before adding layers of wadding and fabric. 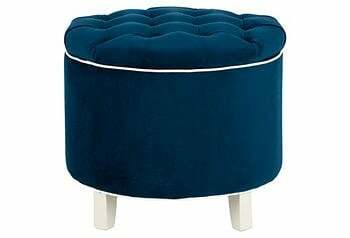 There are lots of photos and instructions for this round single tufted round ottoman with a pleated skirt. Here is In My Own Style Part One and Part Two on how to make your own tufted ottoman. The following video shows how to make an ottoman look differently by mixing skirts, fabrics styles and adding braid all using a glue gun. Youtube shows how to cover a footstool or coffee table by adding cushioning on top. A tutorial from Design Sponge shows a boxed ottoman. Being larger, and square, its the perfect size to use as a coffee table. Piping gives it a professional touch, but means getting out the sewing machine! Find the tutorial here. YoungHouseLove's tutorial shows how to make an ottoman, tufted, square and upholstered, using a coffee table as a base, or creating your own base. This piece is larger and also doubles up as a coffee table. Its large enough to add an ottoman tray and style. 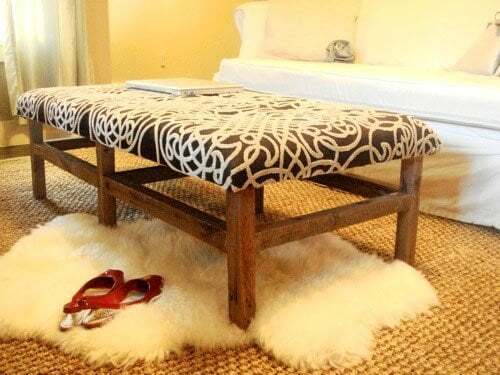 Click here for styling ottoman trays. This coffee table ottoman cost $32, using mostly free pieces from around the home. Here is a summary - but go to the site for the full tutorial. Step 1- Cut a piece of wood (or MDF) and 2 inch foam to the ottoman coffee table size of your choice. You could use an existing coffee table - which makes this even easier. Drill holes through your table to add button tufts. Step 2 - Cover your wood top with contact cement and place 2 inch foam on top. Step 3 - Cover the top with extra batting; enough to cover and secure underneath with a staple gun. Trim the excess. Step 4- Cover batting with your fabric. Making sure you fabric pattern is in the middle of the table, staple it in the middle, then do the same on the opposite side; make sure it is taut but not too tight. Do the same with the other sides. This avoids bunches and bulges. Step 5- Finish your corners. For each corner; pull the left flap to the right and staple. Then pull both flaps to the left and staple. Make it as neat as possible and finish all four corners. Step 6 - Button and cover kits for tufting are found at your local craft store. Cover your buttons with your fabric following kit instructions. Step 7- Using a very large needle, string a heavy and strong thread. Do not cut the thread. Step 8- Push the needle and thread through the back of your piece, through the holes. You may need pliers to help you pull your needle through the hole. Step 9- String your button onto the thread then back through the hole. Step 10- Threading a washer onto one end of the string will make sure nothing comes loose. Do this for all your holes. Step 11 - Add this to your table base. You can make one or buy one. This project cost $32 using mostly free pieces. 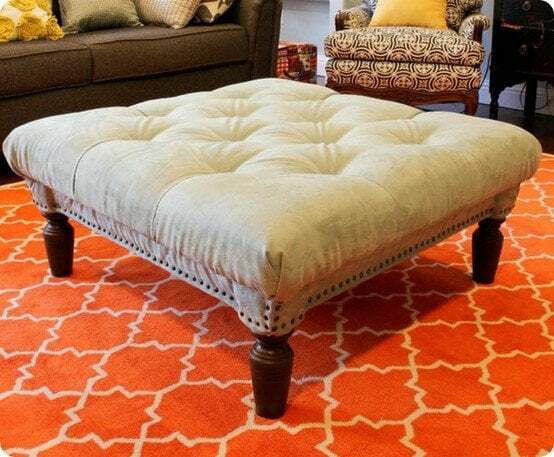 FiveDaysFiveWays shows you how to make an ottoman using a Craig's list table as a base, creating a tufted ottoman. There are similarities with the ottoman above. The base cost very little and the result is great! AStrollThuLife article How To Make an Ottoman is a traditional looking ottoman. 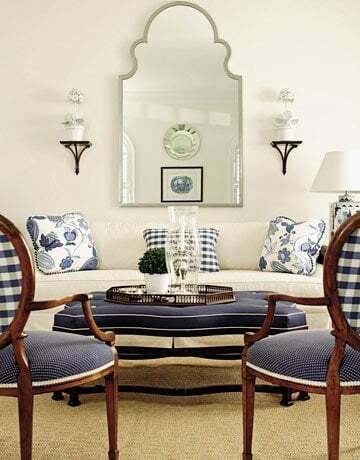 If you like the shape but not the look, use any fabric to create the look you love. The technique is what is important. You are basically making a box by adding a piece of pine, with foam, on top, and connecting the two with piping. Use 4" foam for the top and 6.5" batting to go around your box base. Add feet like these finials above and you are done. ehow has a step by step 'how to make an ottoman' article with great instructions but no photos. I hope this information inspires you to make an ottoman and make it your own unique piece. Like it? Leave a comment, come on over to Facebook or join our email list. Love these ideas.. I'm trying it this weekend on an old coffee table - let's see what happens. Has anyone tried to make one yet? Looks easy enough. These look great and I think I have just the table top to make a storage footstool.. I know ambitious but what the hay! I'm going to buy one of them from One Kings Lane! I Want to make an ottoman what fabrics can I use? you can use any fabric but to be practical, something that is hard wearing. A thicker fabric that can be hand or machine washed is perfect. Stores generally have an upholstery section, so see what they have on offer. Is there a standard or rule of thumb as to the optimal number and size of wheels to have on various round ottomans for functionality and stability? Four wheels is standard and the size of the wheels is more about the size of the ottoman you have. The bigger the ottoman, the bigger the wheels to carry the weight. I hope that helps a little. I would take the dimensions of your ottoman to your local hardware store and see what they suggest. Thanks Gene... If you make one, send in the images! It would be great to see what you have created.